Winter is here! Stay up-to-date when a snow emergency is declared by signing up for an email or phone alert or by downloading the Minneapolis Snow Emergency app that tells you if a Snow Emergency has been declared and informs you where you can and can’t park on Day 1, Day 2, and Day 3 of a Snow Emergency. 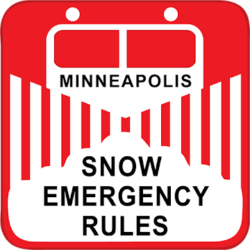 Download Minneapolis Snow Emergency App on iTunes or Google Play. A Snow Emergency will be declared no later than 6 p.m. on any given day. At 9 p.m. on that day, Snow Emergency parking rules begin. Park on either side of non-Snow Emergency routes (these streets DO NOT have the red sign: Snow Emergency Route). After a street is fully plowed, feel free to park there, even if Snow Emergency parking rules are still in effect. Fully plowed means the street is completely cleared and plowed as wide as possible. Plows may come through more than once, so make sure that it is fully plowed as wide as possible before parking. DAY 2: 8 a.m. to 8 p.m.
DAY 3: 8 a.m. to 8 p.m.
City of Minneapolis Snow Parking Rules webpage.